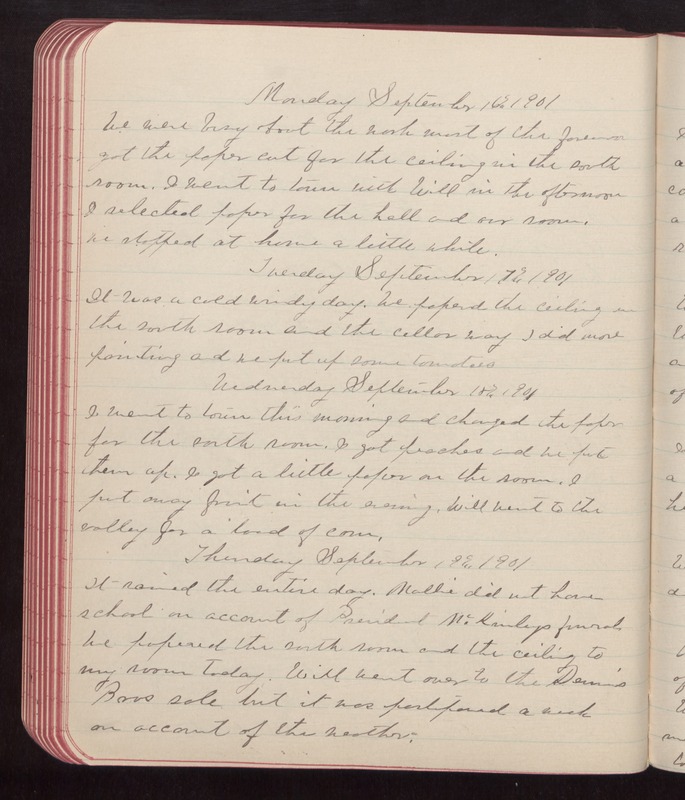 Monday September 16th 1901 We were busy about the work most of the forenoon got the paper cut for the ceiling in the south room. I went to town with Will in the afternoon I selected paper for the hall and our room. We stopped at home a little while. Tuesday September 17th 1901 It was a cold windy day. We papered the ceiling in the south room and the cellar way I did more painting and we put up some tomatoes Wednesday September 18th 1901 I went to town this morning and changed the paper for the south room. I got peaches and we put them up. I got a little paper on the room. I put away fruit in the evening. Will went to the valley for a load of corn. Thursday September 19th 1901 It rained the entire day. Mollie did not have school on account of President McKinleys funeral. We papered the south room and the ceiling to my room today. Will went over to the Dennis Bros sale but it was postponed a week on account of the weather.